From autumn of 2017, Change Partners is an Affiliate partner for Prosci® and the sole provider of Prosci® methodology and tools in the Baltic States. Prosci is a systematic and holistic change management methodology adopted by 66% of the world’s largest companies, including 80% of the Fortune 100. It’s based on 20 years of industry-leading research and proven experience on what it takes to drive successful change. Today, Prosci’s network of partners is operating in 45 countries around the world. 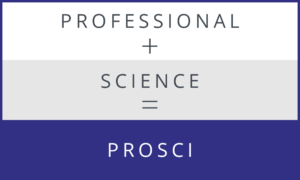 The origin of Prosci’s name is derived from the combination of the terms professional and sciences, reflecting Prosci’s commitment to a research-driven and results-oriented approach to change management. Prosci is most widely used approach in the world to managing the people side of change in organization. One of Prosci’s most significant contributions was demonstrating the connection between effective Change Management and the Return on Investment (ROI) of change projects. This groundbreaking research repositioned Change Management from the “soft” side of change to being accepted as a key factor in achieving project success and benefits. The ADKAR model describes the key elements of individual change management for each employee and how this process leads to changes throughout the organization.